More than 600 people attend this year's CRUSH event — raising over $50,000. CRUSH event director Emily Bolch, ARPM, and executive director of Duke Cancer Institute Michael Kastan, MD, PhD, are up bright and early to welcome participants — both two-legged and four-legged. Kelly Czepial (left) says she's "blessed to have a second chance at life" after surviving colon cancer -- thanks to support of family and friends and treatment by Dr. Strickler. Linda Laws of The River Church team (right) cheers on the runners and walkers. “We’re going to CRUSH it!” she said of the disease that’s taken those dear to her. GI oncologist Yousuf Zafar, MD, who founded CRUSH in 2014, is up and at 'em. Led by Anne Cotton, RN, the Duke Gastroenterology team — Cecum Seekers — raised nearly $2,500. Kima Kearney, CMA, who works in Radiation Oncology at Duke, and her son Addison venture out to support the cause. The DCI Office of Health Equity’s Faiza Mustafa, MPH, and Myesha Smith (OHE intern from NCCU) with a very creative poster. GI oncologist John Strickler, MD, and his son cross the finish line together. A stage 4 metastatic colon cancer survivor and avid runner, Tom Vibert catches his breath after crossing the finish line. Colorectal cancer survivor Andy Riley (right) was the top individual fundraiser overall and in the runner category — raising more than $2,000. Here he is at the end of the run with friend and “A Little Less Behind” team mate Jay Yarborough. Izzy, the daughter of colorectal cancer survivor Andy Riley, and her friend Elin pose at the finish line. Izzy came in second place in her age group. This is Izzy's second CRUSH event with her father and family. Runner DJ Salmon crosses the finish line. He lost his fellow fraternity brother and close friend Darian Hager to colorectal cancer last year. Darian was diagnosed in January 2018 at the age of 45 and passed away six months later. The team is wearing Darian Hager superhero capes and masks for this the team's first CRUSH event. Angela Bowling (left), who works at Duke Stores and is a cancer survivor, is the top individual fundraiser in the walker category — raising over $1,000. She accepts her medal from Ryan Switzer, also a cancer survivor, and Margot O’Neill, a PA at Duke with GI Oncology. Duke PA Margot O'Neill captains this creatively named team of family and friends, including Hope Uronis, MD (far right). Mattie and Adrian rally for colon cancer patient Charlemagne Asekhuano, who has bravely battled cancer for two years. Team Roy gathers in memory of Roy Buchanan. Led by Roy's wife and sister, the team has been in every CRUSH since the beginning, in 2014. 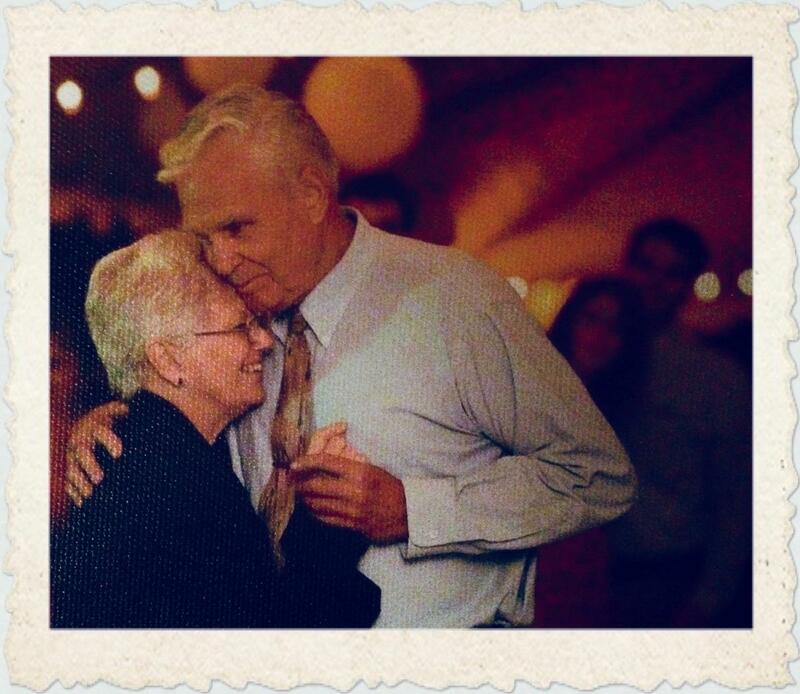 Roy made it to the first CRUSH in 2014, but then lost his battle with cancer. Colorectal cancer is the fourth most common cancer diagnosed in men and in women and the second leading cause of cancer death in the U.S. says the American Cancer Society. One in 22 men and one in 24 women will be diagnosed with colorectal cancer in their lifetime. The Duke Cancer Institute Gastrointestinal Cancer disease group has sought to CRUSH these odds, six years running, by raising funds to support colorectal cancer research and community outreach and education in their annual CRUSH Colorectal Cancer 5K Walk and Run. Thirty-nine teams hit the ground running (and walking) at this year’s event — held on Saturday, March 9, at Durham’s Northgate Mall — raising more than $50,000. Duke Cancer Institute gastrointestinal oncologist Yousuf Zafar, MD, zipped around the outdoor venue, snapping photos of the crowd and popping into a photo or two himself — including with “the Poo emoji” (GI oncologist Niharika Mettu, MD, in disguise). Zafar's wife Fatima Rangwala, MD, founded GI Oncology’s signature event in 2014 and Zafar has been race director in year's past. For GI Oncology research program manager Wanda Honeycutt RN, BSN, CCRP, who served as assistant director of CRUSH this year, the event was, as ever, deeply personal. She was with Zafar and others at the start and has been an active participant and organizer in every CRUSH since. Honeycutt’s mother, a breast cancer patient at Duke, passed away a year after her dad. Though her mother didn’t have colon cancer, Honeycutt raises funds each year to honor both of them — Donald L. Painter and Carol J. Painter — with her aptly named team Partners with Painters In Awareness of CRC. This year was a year of firsts for Claudia Hager of Durham. First year without her husband Darian Hager, whom she lost to colon cancer last year, when he was just 45. First year forming a team for CRUSH — Team Darian Hager — in his memory. And first place. Her team raised nearly $5,000; the most of any team for CRUSH this year. 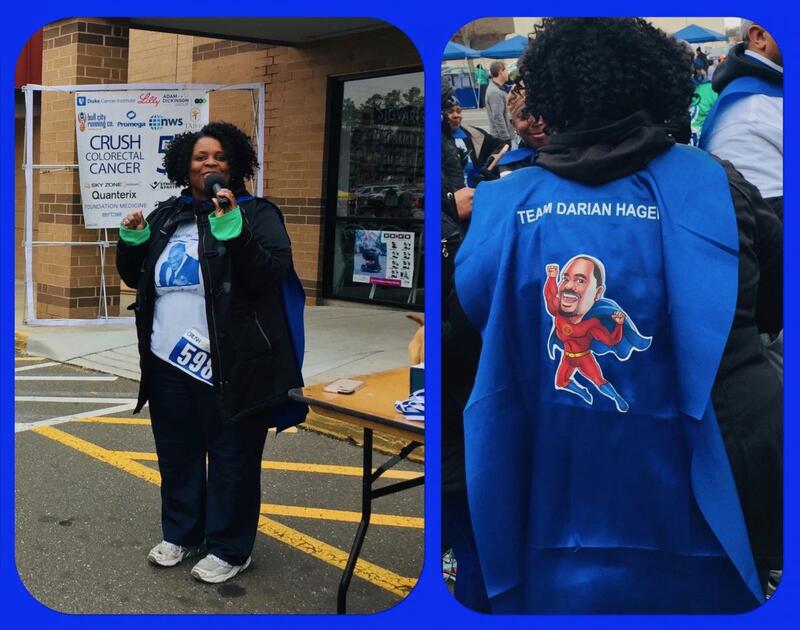 Claudia had shirts and blue superhero capes made — both with Darian’s likeness. More than 50 people registered for the team. “He just wanted us to keep the awareness going which is why we did the team and why we went grand,” she exclaimed. More than 600 souls turned out to CRUSH colorectal cancer on this grey day. In jubilant celebration of survival. In honor of those loved. In memory of those lost. One might say, superheroes all. The CRUSH Colorectal Cancer 5K and Fun Walk and it’s many teams are still accepting donations. Visit the site for more information.